On 2 April 2007, our site opened for business. It had been a labour of love ever since we created it to use for our own wedding a couple of years earlier. 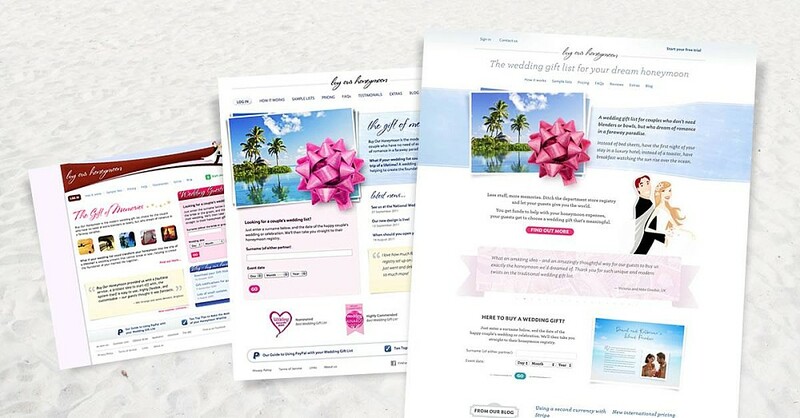 Our own wedding gifts had transformed our honeymoon together, and we knew that the site could help do the same for many other couples. Ten years later, our service is still as personal and meaningful as it’s ever been. We’re proud to be able to personally look after each and every one of the couples who use our site, to grow and adapt our service in direct response to customer feedback and requests, and to bring you years of professional expertise, first-hand. Ten years has seen a lot of changes, but all built on the same rock-solid foundations. We were the first honeymoon registry to charge a simple one-off service fee instead of taking commission on gifts. We pioneered a flexible approach to gift payments, where your gift funds are always paid directly to you. We’ve always made our couples our top priority. 2007 — we launched! Initially only in the UK, and then internationally a few months later. Before long, we’d had couples using our service from all over the world. 2008 — we introduced our Helping Hand service: a way for couples to build and curate a detailed honeymoon fund based on real gifts and real itineraries. We added new themes, new domains for couples to choose, and an improved gift history to help you track the gifts you’d received. 2009 — our design themes became customisable with your own photos, making your gift list even more personal and unique. We also launched Vintage, one of our most popular and versatile themes. 2010 — we launched our multilingual registry service. Now couples with international families could present their honeymoon fund in more than one language. 2011 — we refreshed our site design, simplifying, refining and tuning dozens of our features. And we made improvements to our support for registries without online payments. 2012 — we launched gift payments by Direct Debit: an easy, secure and inexpensive way for couples in the UK to collect funds. We’re the only wedding gift list service flexible enough to provide this, and it’s the most popular way for our couples to receive their gifts. 2013 — we overhauled each and every one of our design themes, updating them for the modern web and making them work perfectly on mobiles and tablets as well as desktop computers. And we introduced easy open contributions, allowing couples to simply and conveniently mix-and-match individual priced gifts with open-ended donations on the same registry. 2014 — we introduced gift payments by Stripe: better, simpler and cheaper credit and debit card payments that work globally. We added the ability for couples to set a target value for open contributions, and refreshed our main site design again so you could easily manage your registry on your phone. 2015 — we launched our unique geo-targeting service, so that couples with international families can direct their guests to the most appropriate form of payment for where they live. 2016 — we moved our entire service over to a brand-new infrastructure, making the site faster, work with more languages (and emoji) and even more secure. 2017 — we’re just getting started! Already this year, we’ve introduced two new themes and new international pricing. And we’re determined to keep building on everything we’ve achieved so far. Thank you so much to all the tens of thousands of couples who’ve used our service since 2007. Thank you to those of you who have contacted us with suggestions and feedback along the way. And thank you to everyone who has sent us kind words or posted lovely reviews. We’re off to open some champagne! Cheers!